6:30-10pm–LA Plaza de Cultura y Artes Día de los Muertos Altar Tribute Celebrating Life of Mexican Singer Juan Gabriel. Event will feature altar installation & free concert appearances by Angeles Ochoa, Stephanie Amaro, Mariachi Garibaldi, Julian Torres, Blue Agave & Ballet Folklorico de Los Angeles. LA Plaza is located at 501 N Main St, LA 90012. For more info, visit http://lapca.org/. 5-9pm–Halloween Fright Fest at Montebello City Park Baseball Field (Los Angeles and Taylor Ave.). Family fun includes a haunted house, live band, free games, jumpers, costume contests, photo booth and more. Call the Youth Center at (323) 887-4577 for more information. 9am-12pm–Boyle Heights Clean Street challenge. Join the neighborhood council & local organizations in beautifying the neighborhood. Water & snacks provided. For more info, including where to meet, call (323) 475-9483. 9am-3pm–Too Toxic to Trash: Free LA County Hazardous & E-Waste Roundup at the Liberty Community Plaza located at 14181 Telegraph Rd. in South Whittier. Safely discard household hazardous waste: antifreeze, old medications, car batteries, used motor oil, paint, pesticides, needles, syringes, lancets, household batteries, fluorescent light bulbs; and e-waste such as TVs, monitors, computers, VCRs, stereos, and cell phones. For more information, call LA County Dept. of Public Works at 1(888) CLEAN LA or go to www.888CleanLA.com or call LA County Sanitation Districts at 1 (800) 238-0172 or www.lacsd.org. 10am–Celebrate Día De Los Muertos at Calvary Cemetery in East L.A, hosted by the LA Archdiocese. Festivities are free and begin with Mass & presentation about meaning and significance of the celebration commemorating All Souls Day. Cultural family-event will include traditional altars honoring the departed, folkloric dancers, Mariachi concert, activities for kids, and a special performance by Latin Grammy® nominated Trio Ellas. Calvary is located at 4201 Whittier Blvd. LA 90023. For more information, visit http://archla.org/diadelosmuertos. 2-3pm–Saturday Movie Afternoon: The Ghosts of Macchu Picchu at the Bell Gardens Library. PBS documentary, The Ghosts of Machu Picchu, explores the secrets of the Incas’ greatest achievement, a city situated atop a mountain crest. How was it built? Why was it abandoned? For all ages. Parental guidance suggested. Free admission. Library is located at 7110 S. Garfield Ave. Bell Gardens, CA 90201. For more info, call (562) 927-1309. 10am-7pm–“Fiesta Muertos Weekend Festival” At Olvera Street. Eoche de Ofrenda njoy live cultural entertainment, theater, community altars, and face painting both days. Free Admission. Plaza Kiosko: 125 Paseo de La Plaza, LA 90012. (Across from Union Station). 7-9pm–Noche de Ofrenda at Grand Park in Downtown L.A. Free event produced in partnership with Self Help Graphics & Art. Features traditional dance and prayer led by the local indigenous community, L.A.-based poets and musicians. Master altar maker Ofelia Esparza will unveil a community altar, where offerings can be placed by all. Performances by La Victoria / Casa 0101 Youth Teatro / Danza Chicomecoatl / Cuicani. Grand Park is located at 200 N. Grand St. (between Grand & Hill). For more info, visit http://grandparkla.org/event/. 3:30-5:30pm–Monster Mash at Bell Gardens Veterans Park. Join the Halloween party and participate in the costume contest, enjoy Halloween music and monster snacks. Ages: 5-14. Cost:$2. Park is located at 6662 Loveland St. For info, call (562) 806-7650. 4-6:30pm–Free Halloween Trick-or-Treat in El Sereno. LA-32 NC presents Spectacular Halloween fun, free candy & giveaways, snacks, activities spooky music & more. Children come in costumes. Meet the Dreby Doll Skaters. Location: La Cocina Parking Lot: 4989 Huntington Dr. LA 90032. 5-8pm–Boyle Heights 1st Street Trick-or-Treat, between Boyle Ave & Soto Street. Participating merchants giving out wicked candy; Beware upon entering the haunted Boyle Heights City Hall. 5-9pm–Halloween Fun for the Family at Cypress Park Recreation Center: 2630 Pepper Ave. LA 90065. Enjoy Costume contests for pet & people of all ages, coloring station, arts & crafts, haunted rooms, carnival games, raffles & more. Free Admission. For more information, call (213) 485-5384. 2-7pm–Day of the Dead Altar Celebration at Epiphany Episcopal Church in Lincoln Heights Celebrate Community Service. Altars will be constructed and church; community welcome to add personal pictures, recuerdos to the altars. Featured: Altars dedicated to the often nameless homeless who have died & the 43 disappeared student martyrs of Ayotzinapa Mexico. The observance coincides with an exhibition on ancestors of the peace and social justice movement locally and nationally and the role of Epiphany Church in the civil rights movement. A reception will be held after the celebration. Epiphany Church is located at 2808 Altura St, LA 90031. For more info, contact Rosalio Munoz at (323) 229-1994 or by email at chalio.munoz@yahoo.com. 3:30-5:30pm – Dia de los Muertos Celebration at Bell Gardens Veterans Park. Learn about the historical Mexican holiday. Make sugar skulls and enjoy treats. Cost: $2. Park is located at 6662 Loveland St. For info, call (562) 806-7650. 4-6pm – Sugar Skull Painting at Bell Gardens Youth Center. Decorate sugar skulls and learn about the historic tradition. Fee: $1. Center is located at 5856 Ludell St. For info, call (562) 806-7667. 7pm-12 Midnight–Calavaera Dance Party at Mi Centro LGBTQ Boyle Heights. Enjoy an evening filled with art, music, dinner, drinks & dancing. Proceeds benefit the LGBTQ youth empowerment program of the Latino Equality Alliance. For sponsorship opportunities, contact Edde Martinez at (213) 446-7125 or email director@latinoequalityalliance.org. Advertise your event in EGP’s print and online Community Calendar for one low price. For more information, email advertise@egpnews.com or call (323) 221-1099. To submit an event to the Community Calendar, e-mail calendar@egpnews.com by 5 p.m. Friday for the next Thursday issue. Space is limited. 6-9pm–Opening Reception “Sacred Memories: Cross Cultural Expressions of Day of the Dead” Exhibition Presented by El Pueblo Park Assoc. & El Pueblo Historical Monument in the Biscailuz Gallery: 125 Paseo de La Plaza, LA 90012. Exhibit open 10am-3pm, Tues-Sunday through Dec. 4. Free admission. Take Metro to Union Station. 4-8pm—Free Horror Movie Night at Neighborhood Center. Center is located at 5656 Ludell St. For info, call (562) 806-7667. Noon-4pm–Heritage Square Museum Mourning Tours & Family-Friendly Halloween. Play periods games, 19th Century harvest crafts, spooky stories, pick a pumpkin. Admission: $20 Adults/$15 Seniors /$8 Children 6-12. Heritage Square is located at 3800 Homer St. LA 90031 (adjacent to the Arroyo Seco/Pasadena Freeway. For more info, call (323) 225-2700 or visit www.heritagesquare.org. 4-7pm–Free Día De Los Muertos Event at Bell Gardens Ford Park. Celebrate a tradition with authentic “alter” exhibits, pre-Columbian and folklorico dancers, singers and more. Park is located at 800 Park Lane. For info, call (562) 806-7650. 7pm–Olvera Street Annual Día De Los Muertos “Novenario Processions” through-Nov. 2. Join the processions nightly beginning at the Avila Adobe. Come dressed in Dia de Los Muertos attire. Traditional altars, music, ceremony. Free pan de muerto and champurrado after the procession. Historical Olvera Street is located across from Union Station, between alameda and Main Street. 3-8pm–Halloween Festival at the Lincoln Heights Certified Farmers Market. Fund for the entire family. Costume Parade at 5pm; “Ghostbusters” Movie Viewing at 5:30pm. Shop for quality produce while there. Location: N. Broadway & Workman in the public parking lot. 10am-7pm–“Fiesta Muertos Weekend Festival” At Olvera Street. Enjoy live cultural entertainment, theater, community altars, and face painting both days. Free Admission. Plaza Kiosko: 125 Paseo de La Plaza, LA 90012. (Across from Union Station). 5-8pm–Hathaway-Sycamores Harvest Festival at the Resource Center. Enjoy free games, ballon art, photo booth, arts and crafts, a costume parade and treats. Food will be sold for $1. Center is located at 840 N. Avenue 66, L.A. 90042. For info, call (323) 257-9600. 3-10pm– Third Annual Day of the Dead Celebration – “Remembrance” at Our Lady of Guadalupe School in El Sereno. Great food, music & community altar. School Address: 4522 Browne Ave, LA 90032. 1-8pm–El Sereno Dia de los Muertos Festival. Enjoy traditional blessing by Semillas School, live music, art, altars, food and much more. Location: Huntington Drive between Portola and Pueblo Streets. For more info, call (323) 226-1546. 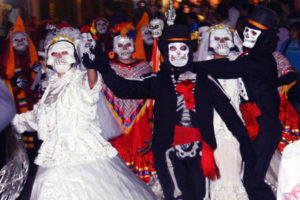 7pm—Olvera Street Annual Dia de Los Muertos “Novenario Processions” 7pm nightly through-Nov. 2. Join the processions nightly beginning at the Avila Adobe. Come dressed in Dia de Los Muertos attire. Traditional altars, music, ceremony. Free pan de muerto and champurrado after the procession. Historical Olvera Street is located across from Union Station, between alameda and Main Street. 3:30-5:30pm–Zombie Run at Bell Gardens Veterans Park. Register in the Veterans Park Game Room. Ages 5-14 welcome. Cost: $2. Time: 3:30-5:30pm. Veterans Park Game Room is located at 6662 Loveland St. Bell Gardens 90201. 4-5pm– Day of the Dead Earrings – Art Workshop for Adults at East Los Angeles Library. Learn to make Day of the Dead earrings from scratch. Supplies will be provided. Library is located at 4837 E. 3rd. Street. L.A. 90022. For info, call (323) 264-0155. 3:30-5:30pm– Monster Mash Party at Bell Gardens Veterans Park. Participate in a costume contest and enjoy cool Halloween music along with tasty monster snacks. Open to ages 5 to 14. Cost: $2. Park is located at 6662 Loveland St. For info, call (562) 806-7650. 11am-1pm–Halloween Party at Bell Gardens Senior Center. Join others in a spooky, fun party. RSVP required. Center is located at 6722 Clara St. For info, call (562) 334-1799. 4:30-5:30pm–Halloween Party at Chet Holifield Library. Come dressed in your favorite costume and participate in games, contests and snacks. Refreshments will be served. Library is located at 1060 S. Greenwood Ave. Montebello 90640. For info, call (323 728-0421. 6:30-8pm – Haunted East Los Angeles: Book Talk with Author Mario J. Becerra. “Haunted East Los Angeles” includes chapters on the most haunted locations in East L.A. including Evergreen Cemetery, Stevenson Middle School and former Linda Vista Community Hospital. Books available for purchase; Refreshments. Library: 4837 E. 3rd. St. L.A. 90022. For info, call (323) 264-0155. 4-8pm– Free Halloween Carnival at Bell Gardens Neighborhood Youth Center. Enjoy games, candy, a costume party, free hot dogs, photo booth & live DJ. Open to ages 3 to 17. Center is located at 5856 Ludell St. For info, call (562) 806-7650. 2-4pm–Halloween Parade and Face painting at Bell Gardens Library. Attend the annual Halloween parade in your costume and get your face painted to match. Library is located at 7110 S. Garfield Ave. For info, call (562) 927-1309. 1pm–Dia de los Muertos Vigil at Calvary Cemetery in East LA. Hosted by the Catholic Cemeteries of the L.A. Archdiocese. Festival is free with a mass at the main mausoleum followed by traditional altars, folklorico dancers, mariachi and activities. Cemetery is located at 4201 Whittier Blvd. L.A. 90023. For more info, visit archla.org/diadelosmuertos. 3:30-5:30pm–Dia de los Muertos at Bell Gardens Veterans Park. Celebrate and learn about the historical Mexican holiday. Make sugar skulls and enjoy traditional treats. Cost: $2. Park is located at 6662 Loveland St. For info, call (562) 806-7650. 4-6pm– Sugar Skull Painting at Bell Gardens Neighborhood Youth Center. Learn about the historical Mexican holiday and paint a sugar skull to take home. Supplies will be provided. Cost: $1. Center is located at 5856 Ludell St. For info, call (562) 806-7667. 5-9pm—ELACC Costume Party at Casa del Mexicano in Boyle Heights. Nonprofit ELACC Comite de Actividades hosts free family-friendly event, featuring a costume contest, music and prizes & delicious food for purchase. Casa del Mexicano: 2900 Calle Pedro Infante, LA. For more info, call (323) 604-1955. 12-3pm—Self Help Graphics & Arts Dia de Los Muertos Community Art Workshops: Join the SHG Family for our yearly Día de los Muertos Community Art Workshops. All materials and teachers are provided. Be on time; wear work clothes. Location: Belvedere Park (Lakeside): ELA Civic Center -3rd St. LA 90022 For more info, visit www.selfhelpgraphics.com . 2-3:30pm-East Los Angeles Library Halloween Extravaganza. Kids, come in costume for an afternoon of Halloween games and music. Special treats & refreshments donated by Los Amigos of East Los Angeles Library. Library: 4837 E. 3rd St. LA 90022, For more information, call (323) 264-0155. 7pm—Two Halloween Movie Nights at Sycamore Grove Park Bandshell: Oct. 17 film is Hotel Transylvania; Oct. 24 watch Jurassic World. Sponsored by Film LA, Arroyo Seco NC, LA Recreation & Parks & Councilman Gil Cedillo. Free popcorn, snow cones & candy. Bring a blanket or chair. Sycamore Grove: 4702 N. Figueroa St. LA 90042. If it rains, event moves next door to Ramona Hall. For info: Sylvia Robledo at (323) 550-1538. 12-4pm—Boyle Heights Harvest Festival Hosted by Zamora Bros. and CD-14 Office. FREE pumpkins, activities for kids, face painting, music and raffles. Location: 1903 Cesar Chavez Ave. 90033. For more info: (323) 227-6944. 3:30-5:30pm – Extraordinary Pumpkin Painting at Bell Gardens Veterans Park. Decorate your own pumpkin to take home. Prizes will be awarded for most creative designs. Open to ages 5 to 14. Cost: $2. Park is located at 6662 Loveland St. For info, call (562) 806-7650. 4-5pm– Halloween Spooktacular at City Terrace Library. Celebrate the spooky holiday with Tony Daniel’s magic show. Open to all ages. Library is located at 4025 E. City Terrace Dr. LA 90063. For info, call (323) 261-0295. 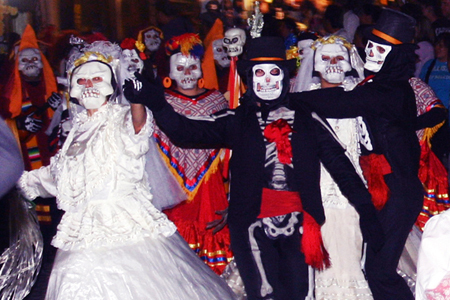 Olvera Street Annual Dia de Los Muertos “Novenario Processions” 7pm nightly through-Nov. 2. Join the processions nightly beginning at the Avila Adobe. Come dressed in Dia de Los Muertos attire. Traditional altars, music, ceremony. Free pan de muerto and champurrado after the procession. 7:00 p.m. | Avila Adobe, Olvera Street, and North Plaza. 4:30-5:30pm–Halloween Party at Chet Holifield Library. Come dressed in your favorite costume and participate in games, contests and snacks. Refreshments will be served. Library is located at 1060 S. Greenwood Ave. Montebello 90640. For info, call (323) 728-0421. 2-4pm–Halloween Parade and Facepainting at Bell Gardens Library. Attend the annual Halloween parade in your costume and get your face painted to match. Library is located at 7110 S. Garfield Ave. For info, call (562) 927-1309.